The V70 model strengthens Volvo's position in the premium estate segment. An expressive design - with a characteristic Scandinavian touch - has been combined with a highly flexible and versatile interior with excellent loading possibilities. In addition, a sporty appearance, as well as sporty driving characteristics completes the model - and the model's overall exclusive impression. The Volvo V70 is now offered with Volvo's two new five-cylinder diesel engines. The engines are a perfect combination of low fuel consumption, high performance and low noise levels. 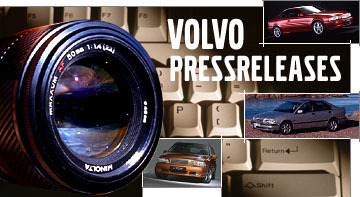 In addition, there are three V70 DRIVe models available as well. One with a 1.6-litre diesel and two Flexifuel (E85) versions; the 2.0F and 2.5FT. Two Flexifuel (Petrol/E85) versions; the 2.0F and 2.5FT. Please note that some systems and functions are optional. The Volvo V70 has somewhat of a "dual personality", meaning a harmonious balance between spacious, versatile loading functions and sporty characteristics. In addition, the car has been given a higher level of luxury, to reinforce its premium qualities. The "soft nose" front, including an egg-crate grille with chromed vertical bars, creates a sporty yet luxurious "face". The tailgate's upper section has a sportier forward-leaning stance. The tailgate overlaps the tail lamps, providing an even wider opening. The glass goes further down at the sides, enhancing rear view. The loading space is increased by 55 litres (compared with the previous V70 model). The interior, with a Scandinavian touch, is a perfect combination of design and function. The V70 R-DESIGN concept includes a number of design details and solutions that enhances the model's sporty and personal impression. The door mirrors, the décor round the fog lights and the grille have a Silk Metal finish, enhancing the sporty profile even further. The grille has an "R-DESIGN" emblem. The double chromed-plated tailpipes (some engines alternatives have one tailpipe), in combination with the rear bumper's black insert, is another example of a sporty R-DESIGN detail. The mouldings round the windows are in anodised black aluminium. In addition, an 18" aluminium wheel, Cratus, is included in the R-DESIGN concept, and so is a colour coordinated tailgate spoiler. Volvo V70 R-DESIGN is available in eleven colours. The R-DESIGN profile is evident on the inside as well. A number of details are in Silk Metal. The upholstery is in a contrasting, sporty mix of Off-Black and Ceramic Light. The front seats have a unique combination of perforated and grooved leather. The front seats have been supplemented with an extra amount of foam, providing extra support for sportier driving - and - enhances the sporty impression. The rear seat and cushions are reinforced, increasing comfort even more. The "R-DESIGN" logo is embossed on the front seats and in the rear seats as well. Volvo V70 Ocean Race Edition is a unique design concept that links the V70 model with the sea and sailing, and not least, the demanding Volvo Ocean Race sailing competition. Volvo V70 Ocean Race Edition is available in two different colours, Ocean Blue Metallic and Electric Silver Metallic. Both colours are combined with a 17" aluminium wheel, "Pontos". This wheel is available in two different versions. The Diamond Cut/Silver Stone version is combined with Ocean Blue Metallic, while the other version, Diamond Cut/Light Grey, is combined with Electric Silver Metallic. Volvo Ocean Race Edition feature a number of other exterior design details as well. There are shiny chrome mouldings round the fog lamps and side windows. In addition, rails in silver and a characteristic "VOLVO OCEAN RACE" emblem are included in the concept. The "egg-crate" grate grille is unique for this V70 version. Inside the car, the marine tone is enhanced by a characteristic leather upholstery with "cross-stitching", a stitching technique used when making sails. This upholstery is available in two colours - Off-Black or Soft Leather. The pockets on each one of the front seats' backrests are in textile and leather (in Off-Black or Soft Beige). A number of interior décor panels inside the car are in Brushed Aluminium. The textile mats on the floor and cargo area protect these areas from dirt. The mats' details in Brushed Aluminium reminds of the sheet that is used to determine a sail's characteristics. The mats are available in Off-Black or Mocca. The marine theme is obvious in the cargo area as well. The cargo area cover has the same type of cross-stitching as the upholstery, and "VOLVO OCEAN RACE" is stamped on the cover's upper side. The "VOLVO OCEAN RACE" logo is stamped here as well. The cargo cover is pulled out using a short piece of rope - a detail closely connected with almost any situation at sea. The rear seat integrated child seats are adjustable in two steps. The top-class comfort level is characterised by increased passenger space - distance from front to rear passengers is increased by 21 millimetres, rear legroom by 48 millimetres and knee clearance by 21 millimetres. Width at shoulder height - in the front seats - is 30 millimetres wider than before. The ventilated front seats with perforated leather (option) are equipped with fans, lowering the seat cushion temperature. This contributes to an even greater seating comfort - especially on hot summer days. The Volvo V70 offers a number of loading solutions. The rear seat is split into three parts - 40/20/40, providing two very comfortable rear seats with a convenient armrest in between. The luggage compartment has aluminium rails and movable anchorage points. The anchorage points can be tucked down into the rails when not in use. The built-in anchorage eyelets in the side panels keep luggage securely in place. In addition, the side panels can be equipped with multifunctional rails, making it possible to attach hooks, load-anchoring nets and cargo space dividers among other loading accessories. The power-operated tailgate (option) can be opened with a push on the remote control. This facilitates loading when the owner has his or her hands full. The Volvo V70 comes with a number of safety solutions - aimed to help avoiding accidents as well as reducing the consequences of a collision. The height-adjustable integrated child booster cushion provides children of different sizes with a good view through the windows, while at the same time contributing to a high level of protection. The booster cushion, providing optimum seat belt geometry, is even more effective in combination with the specially adjusted force limiters. The Inflatable Curtain has been extended by 60 mm compared to previous models. In combination with the booster cushion and a strong body side, it helps increasing the side impact protection - for children of different sizes. In addition, the side structure has been combined with two-chamber side impact airbags. The Volvo V70 features Volvo's patented front structure as well. The structure is divided into zones with different steel grades. All engines are mounted transversely, including the six-cylinders, and help reducing the risk of penetration into the passenger compartment. Volvo's Whiplash Protection System provides a gentle damping motion and contact between the head and head restraint throughout the impact sequence. The front has energy-absorption properties, including a soft structure (in front of the bumper) that helps reducing the risk of leg injuries to pedestrians. The reinforced, lower spoiler edge has a forward position and is almost on level with the bumper. This solution helps distributing the contact area of a pedestrian's or a cyclist's leg, helping to further reduce the risk of injury. The raised bonnet's underside has a honeycomb structure which helps absorbing the energy and reducing the risk of injury. Collision Warning with brake support and emergency brake lamps helps avoiding rear-end impacts or minimise the consequences of a collision. Adaptive Cruise Control helps keeping a safe distance to vehicles ahead. The model has a number of advanced and interacting braking functions, such as Hydraulic Brake Assist, Optimized Hydraulic Brakes and Fading Brake Support. Volvo's Personal Car Communicator, an advanced pocket-sized control centre for increased personal security, is available for the Volvo V70. The Personal Car Communicator provides information about the car's lock and alarm status if the owner is up to 100 metres away from the car. It's even possible to detect if there's someone in the car. Laminated glass all around, including the tailgate and rear side windows, is an option. The storage system under the luggage compartment floor has a loading capacity of 46 litres (without a spare wheel). The storage space locks automatically when closing and locking the tailgate. The Volvo V70 can be equipped with the HomeLink function. The function makes it possible to operate up to three remote controlled home devices (e.g., garage door, home alarm system, etc.) via a module integrated into the sun visor. HomeLink contributes to easy and safe access to your home. Volvo V70 is available with an advanced function that helps reducing the risk of alcohol-related traffic accidents. This function, Alcoguard, is an immobiliser that helps the driver to make a decision whether to drive or not while influenced by alcohol. However, it is ultimately the driver's responsibility to make "sober" decisions in relation to the Alcoguard function's recommendations. The Volvo V70 is either front-wheel driven or equipped with AWD - All Wheel Drive. The V70 model is offered with two six-cylinder engines - a powerful turbo engine and a highly comfortable, normally aspirated engine. As in all modern Volvo cars, the in-line six-cylinder units are mounted transversely. These engines are extremely compact and perfectly integrated with the front structure. The 3,0 litre turbo engine (T6) features a turbocharger technique, taking in exhaust gases in two stages. This enables a more compact turbocharger that provides extremely swift response, fully comparable with a twin-turbocharger solution. The model is also available with a 2.5 l five-cylinder, light-pressure turbo engine. The turbocharger is integrated into the manifold, contributing to the engine's compact format. The turbocharger withstands high exhaust temperatures and contributes to an efficient combustion and low exhaust emissions. This engine has been further developed and is available in a Flexifuel model, delivering the same performance. It is compatible with both manual and automatic gearboxes. The Flexifuel engine meets the European emission standard Euro 4. Two new five-cylinder diesel engines are available for the Volvo V70 - the high-performance, twin-turbo D5 and the medium-performance, single-turbo 2.4D. Actually, the new engines only share the number of cylinders with their predecessors. The D5 has several advanced technical features, such as the twin turbochargers and the fuel injection system, which provide an excellent combination of high performance and low fuel consumption. The D5 engine fulfils the Euro 5 norm. The development of the new D5 has resulted in low engine noise and enhanced comfort. It delivers 204 horsepowers and 420 Nm, and the fuel consumption is 6.4 l/100 km (169 g/km). With an automatic gearbox, fuel consumption is 6.9 l/100 km (CO2 183 g/km). The new 2.4D engine is a medium-performance engine based on the same technology as the D5. It is a single-turbo version, providing even lower fuel consumption. Preliminary fuel consumption figures are 6.0 l/100 km and 159 g/km (CO2 emissions). With an automatic gearbox, the figures are 6.8 l/km and 179 g/km. The 2.4D fulfils the Euro 5 norm. It delivers 175 horsepower and 420 Nm. The turbocharger has been optimised for producing high torque already at low revs. A DRIVe (Volvo's environmental concept) version of the Volvo V70 is available since spring 2009 as well, combining large-car qualities with low fuel consumption. The driveline includes a 1.6 litre diesel engine and a manual gearbox. The engine falls into Volvo's 120g category (out of three different categories: 120g, 140g and 160g depending on the car's size and other things). The 1.6D DRIVe delivers 109 horsepower and 240 Nm. Fuel consumption is 4.5 l/100 km and CO2 emissions are 119g, 21% lower than the 2.0-litre diesel engine. There are other unique features that characterise the Volvo V70 DRIVe model, such as a covered grille and a lowered chassis (20 mm at front and 15 mm in the rear). In addition, it has special tyres with low rolling resistance and an optimised electronic power steering. The 2.0-litre, four-cylinder Flexifuel engine (2.0F) runs on bioethanol or petrol. This is a renewable fuel, lowering fossil carbon dioxide up to 80 %. Petrol and bioethanol can be mixed in the fuel tank. The five- and six-cylinder engines can be combined with Geartronic - an automatic six-speed gearbox with a manual gear changing function. In combination with the T6 engine, the Geartronic gearbox has a Sport mode, providing slightly faster gear change. In addition, a six-speed automatic Powershift gearbox is available for the Volvo V70 2.0 F (ethanol engine). Powershift reduces fuel consumption by 8% (in comparison with other automatic gearboxes) and contributes to improved drivability. The chassis has been further developed, in comparison with the previous V70 model. In addition, the Volvo V70 can be equipped with Volvo's advanced chassis system - Active chassis with Four-C. The Volvo V70 R-DESIGN model has a lowered (20 mm at front and 15 mm in the rear) sport chassis, ideal for sportier driving. The T6 model is equipped with AWD - All Wheel Drive, distributing power between the rear and front wheels. The speed-dependent power steering (option) can be completed with a three-step adjustment function, making it possible to adjust the servo assistance and optimize road feedback. The Power Parking Brake is applied automatically, simplifying starting on uphill gradients for example. The DSTC (Dynamic Stability and Traction Control) system helps reducing the risk of skidding. The Volvo V70 can be equipped with Self Supporting Tyres. A Self Supporting Tyre is constructed with stiffer sidewalls in order to carry the intended weight even if a puncture occurs. It is possible to drive at a maximum of 80 km/h for 80 km (fully loaded car) with Self Supporting Tyres. Driveability with a punctured tyre is almost equivalent to an optimally inflated tyre. The Volvo V70 can be equipped with the Tyre Pressure Monitoring System - a control system that warns of low pressure in the tyres. The system has a pressure sensor integrated into the inflation valve in each wheel. The sensors are activated by an accelerometer at speeds over approximately 40 km/h. Volvo V70 with the High Performance or Premium Sound systems is equipped with an USB port, making it easy to attach an iPod®, or other MP3 players or even a digital camera to the audio system. One the USA market, the High Performance and Premium Sound levels have an HD (digital) radio function as standard. With the HD radio function, the driver and passengers can listen to analogue FM radio channels, although with digital quality. In some European countries the Premium Sound and High Performance audio systems can be supplemented with DAB-radio (Digital Audio Broadcast). This function makes it possible listening to radio broadcasts with CD quality. Volvo V70 can be equipped with an additional high-tech function - digital TV, making it possible to watch land-based digital TV in the car. The system also makes it possible to watch pay-per-view television broadcasts, among other things. The Volvo V70 is built and produced with the ambition of minimising the environmental impact, and to provide a clean and healthy in-car climate. Volvo's Interior Air Quality System reduces particles, pollen, gases and unpleasant odours in the passenger compartment. In addition, all textiles and leather are certified under ÖKO-TEX 100. This is an international standard, which ensures that fabrics and hides have been thoroughly tested to check for certain allergy-inducing substances and emissions. The Clean Zone Interior Package provides an improved in-car climate. The system ventilates the passenger compartment automatically (in temperatures above 10 degrees Celsius). A convenient menu system makes it possible for the driver to adjust different systems - such as climate and rear-view mirrors. This system helps increasing the driver's focus on the road and contributes to a high level of comfort.